– Fix sticky sliding sidebar icon. – Fix share icons hover. – Fix custom site width issue. – Fix Links widget issue at customizer. – Major improvements in Customizer. – Compatibility with WordPress 5.x (Gutenberg editor specifically). – Add option to insert logo at Top Bar. – Add option to show Featured Image caption in single post. – Add option to show Featured Image caption in posts list. – Add Goodreads link to social links. – Add Mail link to social links. – Add option to change (Category:) word before category title at category page. – Add option to hide Category description at category page. – Add option to change (Tag:) word before tag title at tag page. – Add option to hide Tag description at tag page. – Add option to show banner on single standard post (useful for old blogs with lots of posts). – Fix 404 page to show full width if 404 sidebar doesn’t exist. – Fix sticky menu height issue at mobile. – Fix Twitter widget connection issue. – Fix Twitter widget links issue. – Add option to include images in tweets for Twitter widget. – Add option to exclude replies in tweets for Twitter widget. – Add option to show full tweet in tweets for Twitter widget. – Add Amazon link to social media links. – Fix Default share image issue at home page. – Add Wikipedia link to social media links. – Add List with Featured Post Blog Layout. – Update Google Fonts list. – Fix inline images in post content in mobile. – Fix share icons in the list with sidebar. – Improve Ajax load SEO friendly. – Add Telegram link to top header social links. – Fix tags cloud issues. – Improve mobile menu action. – Improve sticky header style. – Fix Instagram issue due to API update. – Fix Instagram widget issue in media images. – Fix Sticky logo option issues. – Add option to lazy load video & audio banners. – Improve list blog style appearance on mobile. – Improve views count function. – Add option to count unique views only (From Appearance > Hits Counter Settings). – Add option to change Menu Mobile Button Text. – Fix media upload in widgets area in Customizer. – Add Spotify to Social Media links. – Add option to show tagline under image logo. – Fix rtl slider error issue. – Fix First Letter issue when title uses UTF8 characters. – Fix comments appearance when avatars is hidden. – Fix Comments issue when comments are restricted for logged in or registered users. – Add option to optimize featured images quality. – Fix Blog Title Font Size option on layout with sidebar. – Fix Retina logo on FireFox. – Fix menu mobile button text color issue. – Fix menu items and search icon response on touch devices. – Adjust Sidebar to be wider. – Add option to disable auto og meta data. – Add option to disable Theme’s FB scripts. – Add nofollow to commenter avatar url. – Fix share icons issue with single page when blog style is masonry. – Add Product Hunt to Social Links. – Add Quora to Social Links. – Fix Commenter Avatar link issue. – Add option to customize featured image width x height at Single Post. – Hide Mobile Menu button when top bar is empty. – Fix post format page issue. – Add option to hide Search at Top Bar. – Add option to hide Title at single post pages. – Improvements in banner sizes. – Fix center logo script. – Improve logo dot in arabic version. – Fix favico not found error. – Add Options to Facebook widget. – Add option to show/hide share icons on single posts only. – Add option to show author info at author page. – Compatibility with WordPress 4.9. – Add option to Show/Hide Sliding Sidebar. – Add option to Show/Hide Sticky Menus on single pages/posts. – Add Discord Social Icon. – Fix long sticky menu issue. – Improvements in mobile menu. – Improvements in sliding sidebar. – Add Masonry with Featured Post blog layout. – Add option to set posts per page at blog page. – Improve meta info at mobile. – Minor Improvments and fixes. 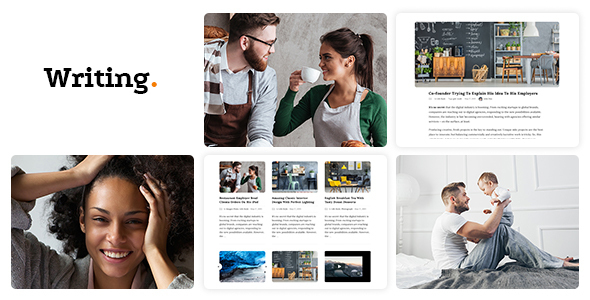 – Improve post content headers typography. – Fix video and audio post height at masonry. – Add Posts Content Width option (Wide, Narrow). – Fix reading progress with sticky header and admin bar. – Fix avatar header button image issue with sticky header. – Add Stumbleupon to share icons. – Add Whatsapp and Telegram to share icons on mobile. – Extend categories in page options to allow multiple categories. – Add options to post format icon. – Fix Author facebook link issue. – Fix rss excerpt length issue. – Fix schemas structure errors for related posts. – Add Author website url to author box. – Add option to set share bar position (before post content, after post content, both). – Adjustments to Typography to improve Readability. – Improve Editor style to be similar to site content typography. – Add Older Posts and Newer Posts to po file. – Fix Continue Reading button issue at custom description. – Add Rich Text feature to Custom Post Description. – Add alt attribute to header avatar image. – Fix missing updated structured data error. – Add option to display excerpt with formatting. – Remove duplicate favicon option. – Option to set share icons to show on hover or always. – Add rich text feature to Footer Credits Text Option. – Add mail icon to share icons. – Add print icon to share icons. – Fix import notice dismiss issue. – Add option to order by views count to Writing – Post List widget. – Fix tagline centering with centered logo. – Fix mobile menu touch. 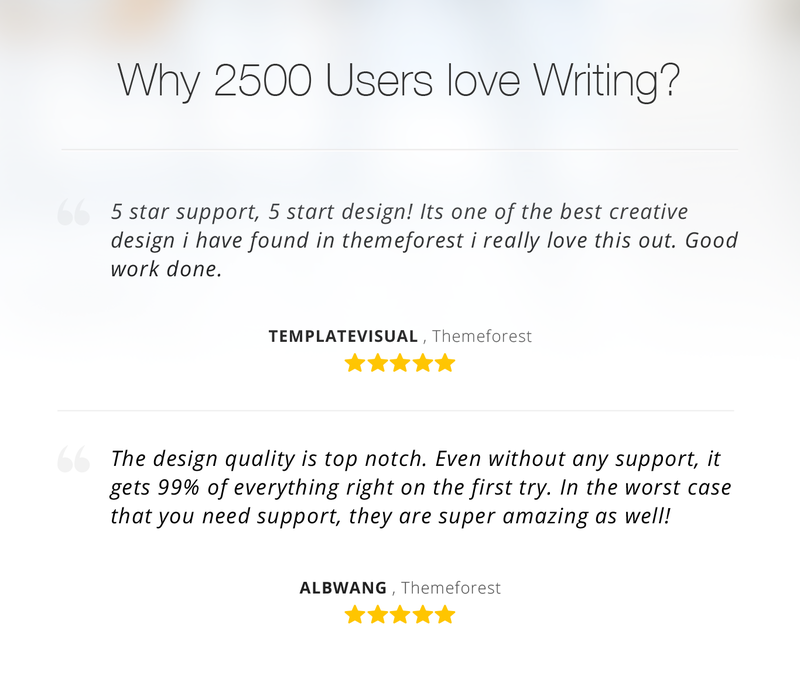 – Add tagline font type option. – Add tagline font size option. – Add tagline line height option. – Add option to disable/enable post formatting at full text blog list. – Add One Click Demo Import plugin support for better import. – Compitability with WordPress 4.8. – Fix center logo style. – Improve logo font style. – Enable rich text at About Me widget description. – Add option to set category for blog page. – Add option to set Logo font type. – Add option to disable default theme gallery. – Fix single blog title font settings. – Add option to set category at postlist widget. – Improve secondary menu on mobile. – Fix issue with input fields at mac safari. – Fix center logo issue. – Add more typography options (blog list title, single post title, widget title, meta info). – Fix issue with Reading more button. – Fix input fields at Safari. – Update Google Fonts Library. – Update FontsAwesome to v4.7. – Improve Related Posts Section. – Add option to select related posts relation (Category, Tags, Author). – Add Pocket share to post share icons. – Update Font Awesome to v4.6.3. – Add option to load theme default fonts locally instead of Google fonts CDN. – Default width changed to improve typography and readability. – Hide Scrollbar at slide sidebar. – Improve slide sidebar scroll on mobile. – Improvements on rtl style. – Fix sticky menu background. – Fix Menu font typography issue. – Add Custom Description option to post settings. – Compitable with WordPress 4.5. – Hide Continue Reading Button if post is shorter than excerpt. – Add Header Background Style Options (single, tiled, cover). – Add Option to Crop/not Crop Featured Image at single page. – Add Option to Hide/show Title and author box at single page. – ADDED: Sticky Menu Option to Customizer. – ADDED: Add Static Home Page Navigation. – Many Improvements and minor bug fixes. – ADDED: Option to add custom header & footer code. – Fix: Issue with site width more than 990px. – Improvements: Post options improvements. – Fix: Comment fields layout issues. – Improvements: Customizer settings UI improvements. – Fixed: Twitter OAuth issue. – FIXED: Hidden sidebar issue from last update. – FIXED: Issues with latin characters in post content. – FIXED: Fixes with posts banner. – ADDED: Option to change site width. – ADDED: Option to hide post content. – ADDED: Option to show/hide read more button. – ADDED: Option to change read more text. – ADDED: Child theme folder added to the package. – FIXED: Instagram slider issues fixed. – ADDED: Options to show/hide each meta info. – FIXED: Sliding Sidebar in mobile view with width smaller than 400px. – FIXED: Featured Image appears in single standard post even if post type is text only. – FIXED: Standart post now shows featured image. – FIXED: Post Navigation Thumbnail Size. – FIXED: Align next post. – FIXED: Jetpack carousel issue. – FIXED: Reorganize customizer options. – ADDED: Options to customize header colors, backgrounds and texts. – ADDED: Options to customize main site background and content background. – ADDED: Options to customize texts colors. – ADDED: Instagram slider widget. – ADDED: Reading progress bar. – Many other Improvements and minor bug fixes. – FIXED – Views issue where some people got error on admin panel. – FIXED – Views counter bug fix. – FIXED – Facebook comments placement improvement. – ADDED – option to display views number. – ADDED – social media links at author box. – ADDED – option to change Site background. – ADDED – option to change header background. – ADDED – option to center site’s logo. – ADDED – option to remove the logo dot. – ADDED – option to enable/disable post excerpt and change its limit. – ADDED – option to change post excerpt end. – ADDED – option to add custom CSS/JS code. – ADDED – option to add facebook comments. – Added: Option to disable gallery cropping in blog list. – Added: Option to show or hide related posts. – Added: Option to add description tagline below or beside logo. – Added: Option to disable cropping banner images in blog list. – Added: Author box to pages. – Added: Option to show or hide author box in all posts and pages. – Added: Option to show or hide author box individual posts or pages . – Added: Option to show or hide share icons in all posts and pages. – Added: Option to show or hide meta info in all posts and pages. – Added: Option to hide post and page title. – Fixed: Retina logo appears in RTL version. – Fixed: Improvements and minor bug fixes for RTL version. – Fixed: Issue in header.php file with some PHP versions. – Fixed: Improvements and minor bug fixes. – Added: Option to upload image logo and retina logo. – Added: Option to set logo width and height. – Added: Option to add favicon. – Fixed: Conflict with post formats.